Pittonkatonk was created from a dialog on how musical labor and music as a commodity shape social relationships and music practices in capitalist society. 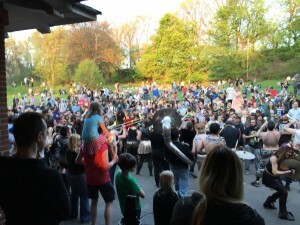 By promoting music as a social practice that brings people together to develop positive individual and social identities, Pittonkatonk created spaces around the city of Pittsburgh where the audience and musicians develop important collective identities, celebrate diversity, and collaboratively work for a common good. Their project empowered people to use their love of music to engage the world around them and to collectively achieve positive social and political outcomes. 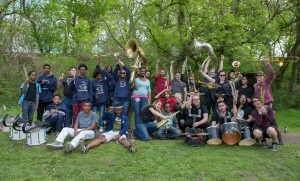 The Young Musicians Collaborative (YMC) connected adults and teens with established musicians in a series of eight workshops organized in four phases and culminating in a public, street-level performance at the Pittonkatonk May Day Brass BBQ. Through the YMC workshop series, interaction with prominent figures in the artist/activist community encourages underserved Pittsburgh-area youth to think independently and collaborate creatively through musical performance, while addressing social issues that directly affect their lives and their community. The program demonstrated the connection between music performance and real everyday issues, encouraged participants to investigate what matters to them, and how to express that when performing. Participants explored musical culture, their own relationship to music and performance, as well as the value and importance of sharing in musical experiences.